As a basketball coach, you have one of the most important and rewarding jobs in the world. Let us help you teach your players the right things &dash; both in basketball and in life. Each drill includes complete, step-by-step illustrations with easy-to-follow instructions. 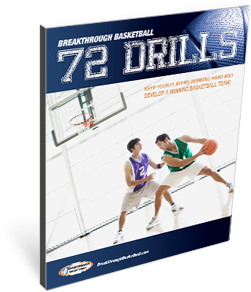 Get dozens of drills to incorporate into your practices. If you make teaching the fundamentals your number one goal, your players will enjoy practice, appreciate their improvement, and be grateful down the line. Easy to use, the book is organized for youth, middle school, and advanced coaches so that everything you need is at your fingertips. Complete this form to receive our FREE 152 page eBook, 72 Winning Basketball Drills.